Tim Springer/WildEarth GuardiansGray wolves of the Yellowstone pack. One member has made its way as far south as Colorado's Vail Valley. VAIL VALLEY, Colorado ” A gray wolf that was tracked to an Vail Valley area north of Avon, Colorado this winter after wandering about 1,000 miles from the Yellowstone region has been found dead. State and federal wildlife officials said the female wolf’s carcass was found in late March in northwestern Colorado after her radio collar sent out a signal indicating she had stopped moving. They declined to say exactly where the wolf was found or how she died. The 18-month-old wolf, a member of Montana’s Mill Creek pack, was caught and collared as part of an effort to improve wolf-monitoring techniques. Federal biologists say the animal, known as 341F, broke from her pack just north of Yellowstone National Park in September and traveled through Montana, Wyoming, Idaho, Utah and Colorado. Her collar indicated she was in Eagle County in mid-February. 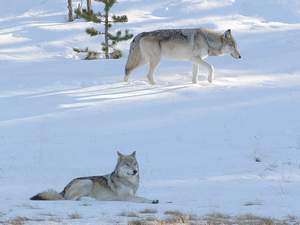 At least one other a Yellowstone-area wolf has made it to Colorado. A young female wolf wearing a radio collar was hit and killed by a vehicle on Interstate 70 near Idaho Springs, west of Denver, in June 2004. Anyone with information is asked to call the Colorado Division of Wildlife at 877-COLO-OGT or the U.S. Fish and Wildlife Service at 970-257-0795.